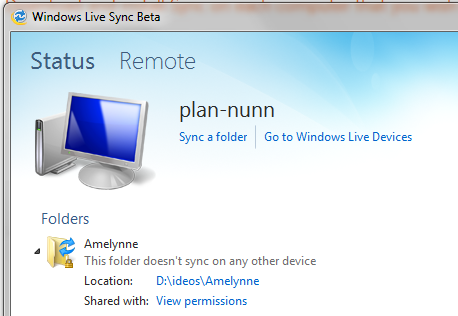 Had a strange problem using the new Microsoft Windows Live Sync Beta. It’s working fine on one of my computers, but on the other one, it drops a letter when I set up a folder to sync. For example, if I want to sync a folder like D:\My Videos, the program accepts the folder I want as D:\y Videos and then creates this new folder for syncing. Or it might sync D:\Archives as D:\rchives. On my other computer - no issues. Investigating a bit, I discovered it doesn’t happen on my other drives (C:, F:). My D drive is different, in that I’ve moved the location of my My Documents folder to D. In a quick test, I discovered that moving it again to a subfolder of D removes the issue. It’s not a permanent solution however, as a) I like having my documents folder in the root of my secondary drive, and b) I would have to move 220Gb of data to an external drive and back again as you can’t move the location to a subfolder of the current location. So I’ve sent feedback to Microsoft using the inbuilt “report a problem” menu in the beta. I did it in two parts though, so this post is my way of putting it all in one place, and on the off chance that someone is having a similar issue, they might get some comfort knowing that it’s not their fault (well it is, but only ever so slightly).